Today's Draw Classic*: The Five of Swords from the Mythic Tarot. Is there something going on in your life that's really got your goat? Is something coming to an end before you're ready...or not coming to an end fast enough? Are you tired of trying to make something change that just doesn't seem to want to change? Nothing blocks life's zing like refusing to accept "what is". And that's what this card has come to tell us about today...acceptance. It doesn't matter if something's unfair or if wasn't supposed to be this way. It's tough beans if you don't like it or if others get to do it and you can't. None of that matters. And you can accept it and find a way to work with it. Or you can fight against it and just create more pain for yourself. I'm not talking about things you can change, here. This isn't a social commentary about becoming a sheep and letting the tide take you. This is about things you can't change. Being fired from a job. The end of a relationship. Getting sick. Having physical, mental or emotional limitations. Pushing up against another person's will. The situation may be end up being different in the future, but right now it is what it is and no amount of begging, fighting, manipulation, displaced anger or vengeance is going change it. Sure, you can do all that stuff. But ultimately you're hurting yourself. And keeping zing at arm's length. And wallowing in bad energy. And creating bad karma for yourself. And changing nothing. Of course there's going to be pain and mourning on the road to acceptance, but holding on to anger/revenge/a grudge is, as they say, like drinking poison and expecting the other person to die. I have a theory that most pain is caused by pushing up against what is. I find myself doing it from time to time. I know my particular situation *can* change. I'm just limited in how much it can change right now. And in the meantime, I'm not doing myself any good or getting any closer to change by not accepting where I am and what conditions are. And, for my situation, trying to change it while I'm limited in my ability to change is just defeating me. But I'm proud to say I have learned to bypass most non-acceptance. And to stop all the histrionics and arm flailing and drama that go along with it. And, for that, I'm grateful. These things—like drama and non-acceptance and the kind of competition we talked about yesterday—are all things that put distance between us and our happiness. We involve ourselves in things that don't serve. And sure, it's not conscious. We don't WANT to be miserable. But sooner or later we need to question what purpose it serves. Usually it this behavior keeps us involved in the stories we tell ourselves—"I never get what I want." "Everyone's always screwing me." "There's so much drama in my life." "I'm not lovable." "Everyone around me is an idiot." "There are no good men out there." "I should be able to do this." "Life isn't fair." etc. and so on. And as long as we're caught up these stories, all the power is outside of ourselves and, powerless, we conveniently never have to do anything to change our lives. The problem is, change and forward movement are what keeps our lives fresh and exciting and full of zing. 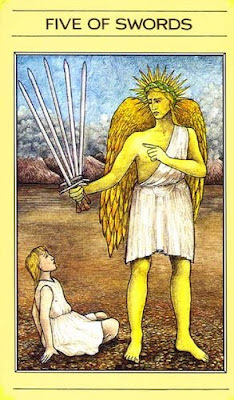 Orestes, the guy on the ground in today's card, is being told by Apollo that he has to avenge his father's death. He doesn't want to do this, but Apollo is a god and this is how things are. Not doing it is just going to make his life worse. And fighting up against "what it" isn't going to change anything. He's still going to have avenge the death. Is there something familiar in that situation in your life? Something where you're just prolonging your pain? Look at all the stuff that you want to change in your life and see which things may just need to be accepted for the time being. If you took away that frustration and replaced it with acceptance, you may not only open yourself up for more joy in your life, but you may just stumble upon a new solution for your problem.